A rendering of Dan Snyder’s proposed new stadium. Seriously. A massive majority of D.C. residents want to give Dan Snyder nothing, save their middle finger. But a few of the most powerful folks around town have been conspiring for some time behind closed doors to refute the will of the people and give the Skins owner choice public lands for a new stadium. A key member of this clandestine pro-stadium clique has hit a bad patch, however. Jack Evans, the longest tenured and possibly most influential member of the D.C. City Council, and a guy who as of last month was telling people that moving Snyder’s football stadium into the Nation’s Capital was a “done deal,” could be in big trouble. Evans’s quagmire means nothing good for Snyder’s reported plan to get his team back to the RFK Stadium site. His record as a councilmember indicates he never met a publicly-funded sports-building-for-billionaires proposal that he didn’t like: No alleged public servant was a bigger cheerleader than Evans for erecting Nationals Park for the Lerner family, once called the richest family in all of sports. Evans also brought out the pom-pons for a project gifting city-owned property to D.C. United what is now Audi Field, and even for granting $55 million of the people’s money for a practice facility for Ted Leonsis’s Washington Wizards. Yes, we’re talking about a practice facility! Jack Evans talking about his “done deal” stadium on election night. Evans said that architect Bjarke Ingels will design the stadium. In 2016, Ingels’s firm, BIG, was profiled in a 60 Minutes segment that labeled him a “Starchitect,” and in that appearance the firm released some renderings of the proposed Skins stadium that bordered on the ridiculous. 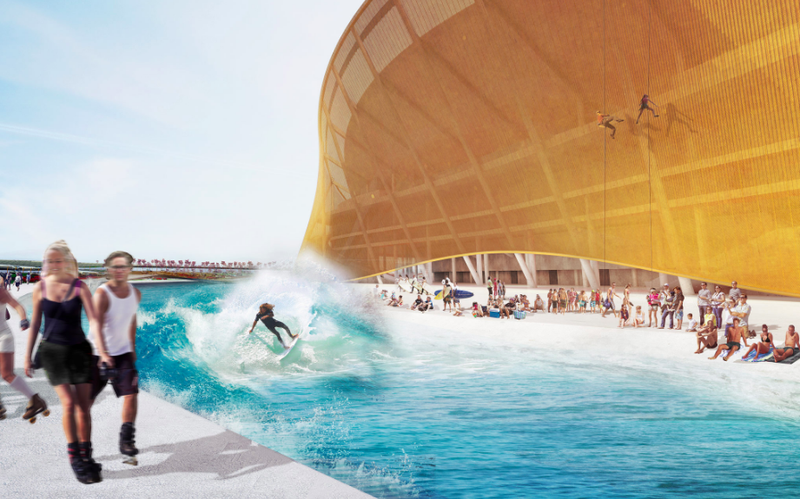 One drawing had surfers catching waves in moats that surrounded the proposed football-centric edifice. Any weakening of Evans’s influence because of the reported ethics investigation would mess with the stadium’s timetable, because Snyder needs Evans at full power if he is indeed going to get his way. If put to a popular vote, D.C. residents would approve spending a billion dollars in public funds on such a stadium only if the deal guaranteed that Snyder would sleep at the bottom of that wave pool. Evans did not respond to several requests for interviews emailed to him and his staff since last week. Joseph Florio, Evans’s spokesperson, said on Tuesday that the councilmember was “unavailable to comment” on the “done deal” assertions. Disclosures: Dan Snyder once sued me for writing mean things about him. And Jack Evans once called me to berate me for writing that Nationals Park was being built with public funds; the dumbass argument Evans made repeatedly during his phone tirade was that all the money used to build the stadium, a tab that eventually hit about $1 billion, would come from new taxes implemented specifically for that project, and therefore those tax revenues can’t be called “public money.” Huh?